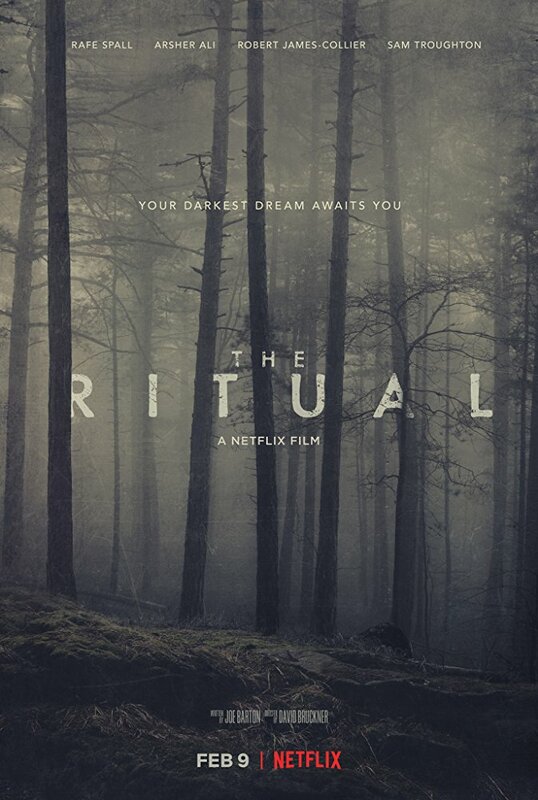 Starring Rafe Spall, Rob James-Collier, Arsher Ali and Sam Troughton, ‘The Ritual’ is an independent, British horror movie directed by David Bruckner and is exclusive to Netflix. It follows four college friends who reunite one year after the tragic death of their friend. After they set out to hike through the Scandinavian wilderness to honour their friend’s memory, they end up walking through a mysterious forest where a menacing presence starts to stalk them. I remember when ‘The Ritual’ was shown in a very limited release late last year and I heard some pretty good things about it. I was very curious to see what a horror movie like this would end up being like. Would it take inspirations from other similar horror movies like ‘The Blair Witch Project’? Would it be scary? After watching it, I can say that this is a nightmarish and unnerving horror movie that really took me by surprise. First of all, there were a lot of things I loved about this movie. The performances were terrific with Rafe Spall at his very best! Rafe Spall gave what might be the best performance of his career as a broken and guilt-ridden man. You understand right off the bat why he feels guilty for the death of their friend and how it has affected him leading up to their hiking trip. He did a fantastic job throughout the movie with an emotionally charged performance. It’s definitely a performance you’ll remember for quite some time. Rob James-Collier was also great as the leader of the group (well he basically was the leader for most of the time). Sam Troughton really surprised me as one of the more interesting characters of the movie. He went through a lot during the course of the movie and he really impressed me. Arsher Ali was also great and one of the scenes that he was the centre of was utterly terrifying. The atmosphere was arguably the best part of the movie. The setting of a Scandinavian forest with an evil force living within it made for a very unsettling atmosphere. The never-ending tree line was practically terrifying for both the characters and yourself as you don’t know if they will ever find a way out of the gigantic forest. It was dark and eerie and the sounds made it even more terrifying. Director David Bruckner has done a solid job with creating this terrifying forest. You can see how a movie like ‘The Blair Witch Project’ and even Norse legends have inspired this movie. What I loved about his direction was his use of tension throughout. For the first two acts, you are under the implication that something evil is stalking them but at the same time, you don’t know if it’s real or just in the mind of our emotionally distressed protagonist. It’s brilliant up until the third act which turns into an exposition-filled, generic horror movie. Although the third act is the lesser of the three acts, it still has one of the most terrifying things I’ve ever seen (I’m talking about the attic scene for those who have seen it). So when I’m talking about the negatives, I’m mainly talking about how different the last thirty minutes is compared to the first hour. As I said before, it’s not terrible, it just could have been executed in a way that was similar to the first hour. I was getting some Wicker Man vibes in that last act because of what was happening but it’s so much different from ‘The Wicker Man’ (That probably made no sense but that is the only way I can describe the third act). The first two acts used tension brilliantly and the implication of something evil worked so well, but then exposition came into it and it kinda took the fun out of it. Overall, ‘The Ritual’ is a great British horror movie that really took me by surprise. Even though the third act does go off in a direction I was hoping it wouldn’t, you can’t help but love the terrific performances and unnerving atmosphere. ‘The Ritual’ is a great addition to the Netflix catalogue and I encourage you to watch it with the lights off.